Quality Component Supply -- High Tech Fasteners, Components, Screws, Nuts, Bolts and Rivets from Gesipa, Dzus, PEM, Richco, Heyco, and others. Quality Component Supply & Mfg., Inc.
Ph 503-646-5800 "Experts in High Technology Applications"
Quality Component Supply has specialized in servicing the needs of high tech OEMs since 1989. With over 65 years of combined experience in the fastener and electronics industry our focus is, and has always been, on problem solving with long term solutions. Do you need In Plant Store, Kan-ban, Breadman Bin Fill or just Stock to Dock? We will configure our programs to meet YOUR stocking needs! We have many years of experience managing class "C" inventory items for customers. Lots of small parts? We love 'em. Our reputation for excellent service is built on the promise of no shortages. Do you need small quantities, special packaging, kitting? We are not only concerned with getting components to your shelf, but also with the best way to get them from the shelf into your product. Do you prefer phone orders, pull slips via Fax, emailing stock reports? We can do it! Our flexibility allows you to put your purchasing on auto-pilot or to micro-manage the line items. We can integrate all of your C-class components under one umbrella. No quantity is too large or too small. Do you need engineering samples? Tell us how many and how fast! 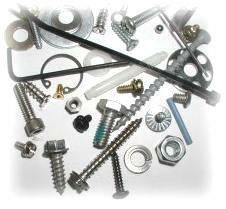 With 40 combined years of fastener supply experience, we can help you choose the right component for your application. Additionally, we have an engineer on staff who can help diagnose problems. Our name is our motto -- "Quality Component Supply"
Copyright © 2004, Quality Component Supply & Mfg., Inc.